A pumpkin quickly deteriorates as Squash Bugs attack. I have squash bugs invading my house for the first time and would like to stop it now before it gets worse. I’ve been seeing them in my garden all summer long but didn’t think they were too bad. Then in the fall, they were on the pumpkins big time. Now they’ve moved and I noticed them on my shrubs and house last week. Today I killed three inside and I hadn’t gone out yet so I know they’re getting in through a crack or some other place. I guess I should start spraying my garden but that won’t be till next year. What can I do now? They’re still on some plants around my house. I can see them on one side for sure. Also, I need something that’s Ok for my organic garden. Squash bugs are light gray, brown to black plant eating insects with piercing sucking mouth parts. Squash bugs use these mouth parts to pierce plant leaves and stems from which they drink and consume plant sap. They prefer garden-variety plants such as summer squash, pumpkins, melons and cucumbers but will readily feed on tomato plants and pretty much anything that’s healthy and available they find in the yard. Most abundant from early summer to fall, squash bugs overwinter as adults and seek protected nest sites for the winter months. If populations exist close to homes or other structures, these buildings will naturally present themselves as great locations to stay during the colder winter months. From the details in your message above, it sounds as if the squash bugs in your garden are now wanting to invade and infest your home as winter approaches so they’re naturally seeking shelter as they’re instinctively wired to do. 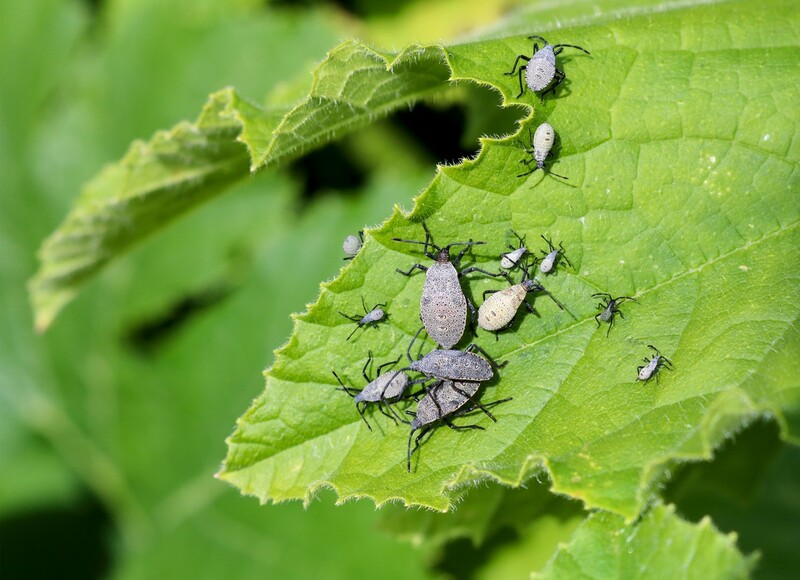 Squash bug control generally takes one full “cycle” or year to see the net result of your effort and applications. Treating the outside of your house now will certainly diminish and stop the invasion. But to get real control, you need to get rid of them where it counts most. This is in the yard and usually centers around their main nest site. 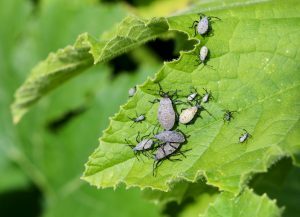 For most homeowners with a squash bug problem, the main site is usually a garden, plant bed or some other densely vegetated section of the yard full of lush plants. Squash bug treatments should start in early spring as they emerge from hibernation. Ideally this treatment should be done prior to the garden being started. Since squash bug eggs will be hatching in the soil and thatch around the garden a liquid treatment early in the year can have a big impact. If done early enough, you can effectively stop infestations stemming from your own yard. There are two applications that should be done in early spring. First, when you till your soil and prepare it for the growing season, apply BIFEN GRANULES. 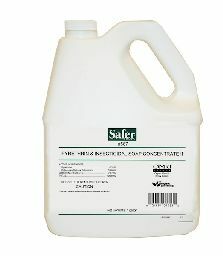 Labeled for use in vegetable gardens, this treatment will provide a month of protection and can be used throughout the season to kill off hatching eggs. Normally all eggs will hatch in the spring so for most gardens, treating for 3 months will do the job. 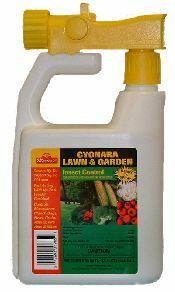 Once the garden is growing plants, use CYONARA RTS to kill off feeding squash bugs and other garden pests through the growing season. Once a month spraying will stop what active and keep more from returning as it will repel insects too. Cyonara is odorless, fast working and safe for use on garden fruit and vegetables. One jug can treat up to 1/2 acre too. 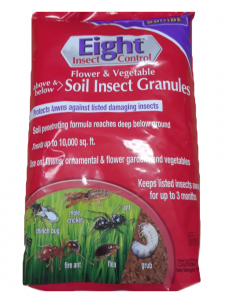 If you prefer to use something “organic”, MULTI PURPOSE INSECT KILLER is quick-acting and strong enough to handle any summer garden pest like squash bugs. It will kill bugs on contact and has just 1 day to harvest which means you can spray squash today and harvest it safely tomorrow. Mix 5.5 oz per gallon of water and plan on getting about 500 sq/ft of coverage per gallon. Also plan on using it twice a month to keep the garden squash bug free. Since squash bug adults are hearty and strong, they will readily seek a good place to overwinter once fall grows late and turns to winter. Letting them live on or in your home is problematic and should be avoided. First, they’ll readily move into living spaces all winter which is annoying but second, in the spring they’ll move back out to your garden. The best spray to keep them off the home is CYPERMETHRIN EC. This active is super strong at both killing and repelling to a range of “bugs” like the closely related boxelder bug, Asian ladybugs and the leaffooted bug. Cypermethrin mixes with water, can be sprayed safely on the outside of the home and treatments will last a month. 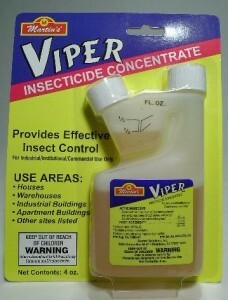 The big advantage with the Cypermethrin is it’s natural “repellent” characteristic which keeps bugs away for weeks. Add 1 oz per gallon of water and plan on getting 500 sq/ft of coverage per gallon of spray. Once inside the home, you’re best option is the non-repelling ALPINE AEROSOL. Spot treat around windows, ceilings, doors and other areas in the home where you see them active. 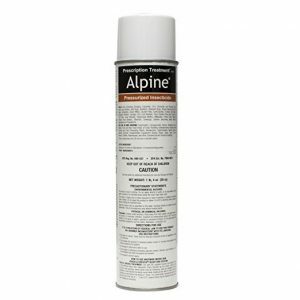 Alpine is what we call “non repellent” and as such, won’t chase squash bugs. But once they walk over it, they’ll die in 1-2 days. During this time they may transfer some back to other bugs if they’re nesting in a group. This is important because squash bugs can be tough to find. Plan on retreating once a week where active and be sure to spot spray new areas where they appear if you find any in between regular treatments. 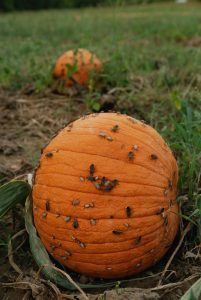 In summary, squash bugs are an invasive pest and when populations around the home are significant, it’s likely some will migrate inside seeking protection during the winter months. To prevent these invasions, you need to treat them out in the yard by nests and key food supplies. This typically is a garden or some area with lush vegetation. Controlling squash bugs in the yard will prevent home invasions come the fall and keep your garden vegetables safe. If you missed your opportunity to treat during the summer and notice squash bugs active on your home in the fall or winter, spray the exterior of the house once or twice to keep them out. Once inside the home, squash bugs will remain active all winter long. Though not aggressive, squash bugs are unsightly and a aesthetically displeasing. By keeping them out of your garden and off your home, you can keep them out of living areas as well.